Our new settled minister is the Reverend Rodrigo (“Rod”) Emilio Solano-Quesnel, who came to Olinda in August 2018. Originally from Mexico City, Rod has lived in Canada since the early 90s, and has called many places home. Rod’s first Canadian home was London, ON, which was followed by Ottawa, where he attended Carleton University, graduating with a Bachelor of Public Affairs and Policy Management (B.PAPM). It was in Ottawa that Rod found Unitarian Universalism, where he attended the First Unitarian Congregation of Ottawa. Following much involvement with its Young Adults group, serving on its Board, and occasionally leading worship, it was here that Rod found his calling to UU ministry. 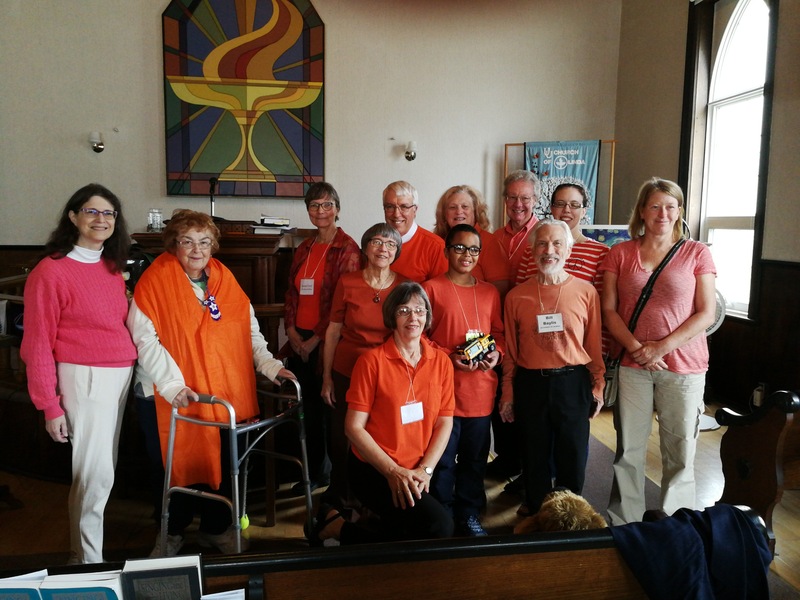 After going to seminary at the Montreal School of Theology (affiliated with McGill University), and serving as Board Secretary at the Unitarian Church of Montreal, Rod made Toronto his next home, serving as Intern Minister at First Unitarian Congregation of Toronto. It was in Toronto that Rod found his partner Sarah. After his internship, Rod and Sarah joined Neighbourhood Unitarian Universalist Congregation, which is in Toronto’s east end. Neighbourhood UU is the congregation that ordained Rod in 2016. At this time, Rod found another opportunity to revisit Ottawa, serving for two years as the Half-time Developmental Minister at the Unitarian Universalist Fellowship of Ottawa, alternating weeks between Toronto and Ottawa, and calling both places home. As the new Settled Minister for the Unitarian Universalist Church of Olinda, Rod has found a new home in Essex county, living in Leamington, and serving congregants who come from as far as Windsor and Michigan. Rod is honoured to share ministry with this historical and vibrant community! The Reverend Frances Dearman (“Fran”) was born and raised on Vancouver Island, where her roots run deep–but even so she has lived and worked across Canada, including ten years on merchant ships, having attended marine school at Sound. Fran has spent a lot of time looking at the Erie shoreline from the water side, and now she’ll be looking out across the Lake from the shore side. Fran loves hiking and being in the environment, and spent the first few years of her life at a small hamlet not so different from Olinda, so she thinks this rural parish and small town thing will be a very good fit. Following five years settlement in Alaska, Fran returned home to Victoria and began doing interim ministry in Canada. Since Fran is a fully accredited interim minister, this is not her first rodeo! But she knows it’s a big first for a lot of folks at Olinda. Fran would like to think that she’s very calm and reassuring as the system undergoes change….. She’d like to think so….. In fact, Fran works hard at self-care, getting lots of exercise and enough sleep so she can bring her best self to Olinda. Fran’s enthusiasm for long walks includes six weeks along the old Camino pilgrim trail to Santiago in northern Spain. So she knows that every journey starts with the first step, and every transition proceeds one step at a time–even the step that seems like a step off a cliff! Fran would like to think that the steadfastness, endurance and tenacity she learned there, and in all weathers on the deck of a Great Lakes freighter, will serve her well through Olinda’s time of transition. Fran takes very seriously the three promises of interim ministry: she will not seek settlement here; she will not serve more than two years; she will make no comment on any colleague whom the Ministerial Search Committee might be considering as a Candidate for Olinda. Fran is here to walk with us, to encourage and support and offer counsel when asked. And when the time is complete, Fran goes home to Vancouver Island. Meanwhile, she is here to walk with us through this time of mindful, intentional transition. Fran loves her Victoria home dearly, and her friends and family there, connections deep and of long attachment. But for now, she’s here, and has become deeply involved in the Olinda Church and the community. We are delighted that she is able to stay on for another year to help us find a new settled minister. The Reverend Christine E. Hillman was called as our minister in 2001, and she served us faithfully until her death in August 2015. She was Olinda’s longest serving minister and was well loved by the congregation. The church is currently served by our interim minister Reverend Frances Dearman while we follow the UUA process to engage a settled minister. Rev. Hillman was married, mother of two and a grandparent. She was a native of the Hoosier state Indiana and raised her children in southeast Michigan. She grew up Lutheran and found Unitarian Universalism through her Indiana University roommate in 1967. With nine other people and her husband, Christine helped to establish a Unitarian Universalist fellowship in Kokomo, IN in the mid 1970s before the move to Michigan. She had an undergraduate degree in Education from Indiana University, a masters of the arts degree in Religious Studies from the University of Detroit where she also taught for almost ten years as an adjunct instructor in the Religious Studies Department. Christine received her masters of divinity from Meadville Lombard Theological School Unitarian Universalist in Chicago 2000. Before coming to Olinda, she served as Interim Director of Religious Education at First Unitarian Milwaukee and had also been Director of Religious Education at three congregations in Michigan. Rev. Hillman’s values and direction included a deep regard for the history and future of Unitarian Universalism, building, expanding and developing the beloved community at Olinda and Canada, connecting with families, volunteering and working for social hope and change. She was also a member of the Canadian Unitarian Council Board of Trustees and the Leamington District Memorial Hospital Pastoral Committee and also carried the on-call pager for six weeks every year.